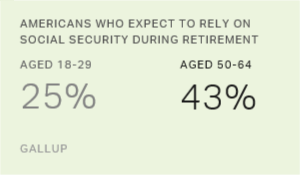 WASHINGTON, D.C. -- A slight majority of pre-retirement aged Americans, 51%, say they are worried a "great deal" about the Social Security system. This level of concern among adults aged 50 to 64 represents the greatest worry about the benefits program of all age groups. One-third of young adults, aged 18 through 29, worry a great deal about the Social Security system. The latest figures are based on combined 2016-2018 data, allowing for greater stability in the findings by age. The trend represents three-year rolling averages starting in 2007. 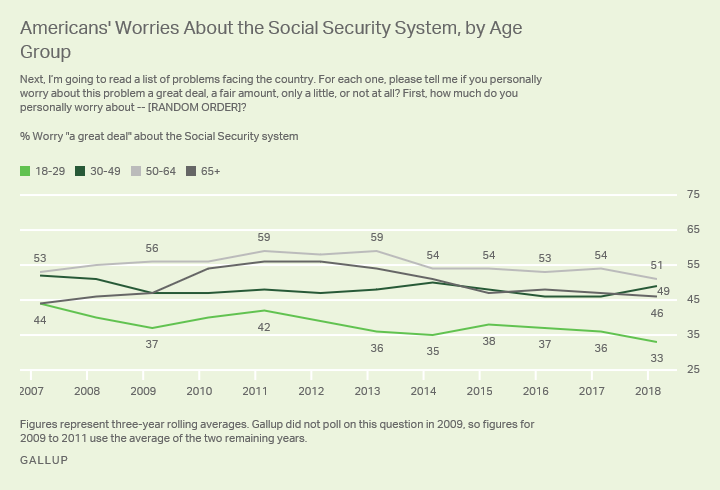 The percentage of 50- to 64-year-olds who are worried a great deal about the Social Security system is smaller than the high of 59% recordedin three-year rolling averages for 2009 to 2011 and 2011 to 2013. The current 33% of 18- to 29-year-olds worried about Social Security is slightly lower than averages in recent years, and down a more significant 11 percentage points from 2007. Less than half of adults who are at the retirement age of 65 or older (46%) say they worry a great deal about Social Security. By contrast, majorities of adults in this age group were concerned about the program during the immediate post-recession years, peaking at 56% in the average for 2010 to 2012. Worry among retirement-aged adults has gradually declined since, though, with the current level of worry at its lowest since the average for 2006 to 2008. Meanwhile, worries about Social Security among adults aged 30 to 49 have varied the least; the current 49% who worry a great deal among this age group is within the fairly narrow range of 46% to 52% averages recorded since 2005. 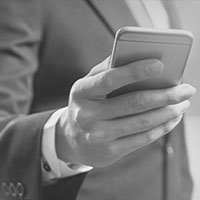 This year's data, recorded in a March 1-8 Gallup poll, found that 44% of Americans worry a "great deal," and 28% say they worry a "fair amount," while about one in four worry "only a little" (17%) or "not at all" (10%). The current 44% who worry a great deal is slightly lower than the 45% to 53% range recorded since 2005. This comes as Social Security recipients will receive the largest cost of living adjustment in six years -- though for many, these increases will be offset by higher Medicare premiums. 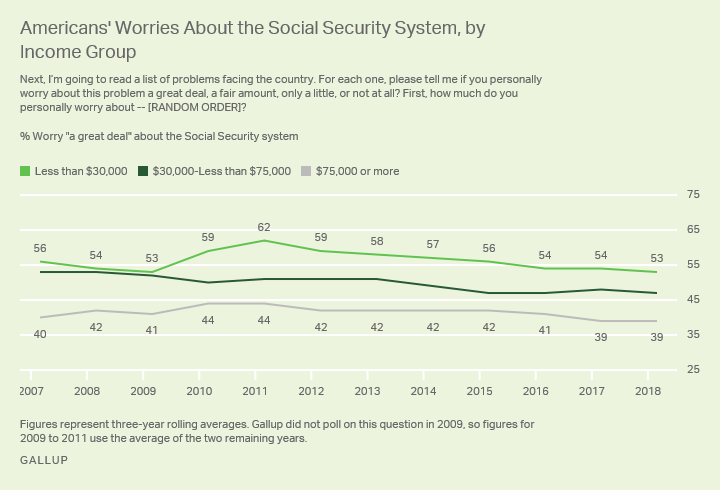 Social Security is one of 15 issues or social problems Gallup asked Americans to rate their worry on in the March poll. It ranks near the middle of the list. Americans remain most worried about the availability and affordability of healthcare. Lower-income Americans have consistently expressed the most concern about the Social Security system. Consistent majorities of U.S. adults in households with annual incomes of $30,000 or less have expressed a great deal of worry in averages since 2005. Worry about the program peaked at 62% in the average for 2009 to 2011 but gradually declined in the years that followed. The current 53% who report worrying a great deal about it matches the low recorded in the 2007 to 2009 average. 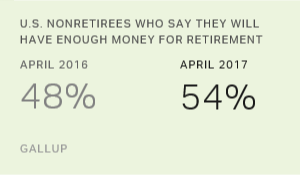 Worries among higher-earning groups have been much more stable. Forty-seven percent of adults with annual household incomes between $30,000 and $74,999 report being worried about the program, which is within the narrow 47% to 53% range recorded for this group between 2005 and 2018. Americans living in households with annual incomes of $75,000 or higher have consistently been the least likely to report worries about Social Security. The current 39% matches the figure recorded in the previous rolling average and is slightly lower than the 40% to 44% averages recorded prior to that. Americans' level of worry about the Social Security system is on the low end of the nearly two-decade trend, but the financial solvency of the program's fate is in jeopardy, as it faces long-term sustainability challenges. So, while Americans' concerns may have shifted elsewhere over the years, the question of how to fund the Social Security system and whether to make adjustments to the program will undoubtedly return at some point -- and Americans' worries about it could return to their post-recession levels. Concerns have eased slightly among those who are nearing the age at which they will receive Social Security. Meanwhile, young adults are less concerned about the program than they have been in Gallup's tracking, and less worried than the older age groups -- perhaps due to the many decades they have to wait until their first check. A smaller majority of lower-income adults are worried about the program than was the case after the recession, but this income group remains more worried than those with higher incomes. Making changes to Social Security to ensure its continuance, a political hot potato that no elected official wants to hold, has bedeviled many presidents. Most recently, worries about the program increased during the first half of Barack Obama's presidency, when his attempts to address the issue troubled even his own party. Prior to that, George W. Bush's attempts to privatize Social Security failed in his second term. Though the question of how to maintain funding for the program long-term is by no means solved, the issue has, at least for now, become slightly less troubling to Americans, as their concerns remain more about healthcare affordability. Both the youngest and the oldest nonretired Americans have grown increasingly likely to say they will depend on Social Security when they retire. Most non-retired investors value having a guaranteed income stream in retirement, aside from Social Security. Fewer have the mindset to achieve it.